Find a therapist in Illinois with GoodTherapy.org. Estimates from the United States Census Bureau suggest the population of Illinois in 2015 was approximately 12.8 million people. Reports from the Bureau of Labor Statistics (BLS) say in 2015, roughly 74,620 residents worked as child psychologists, counselors at drug rehab centers, community health workers, psychiatrists, parole officers, religious workers, health educators, and marriage and family therapists. In Illinois, individuals in these community and social service fields earned an average salary of $48,280. All U.S. states and the District of Columbia were evaluated by Mental Health America (MHA) in 2016. Compared to the rest of the country, Illinois received a somewhat high overall rank of 12th for mental health conditions and mental health care practices. Illinois was ranked 3rd in prevalence, which may indicate a lower prevalence of mental health issues compared to most other states. Authors of the survey from Mental Health America contend that Illinois’ prevalence ranking correlates with the state’s low rates of child maltreatment. In other major mental health categories, Illinois was 10th in adult ranking, 17th in youth ranking, and 31st in access to mental health care. These numbers indicate adults and adolescents have somewhat similar percentages of mental health issues and access to care, but overall access to care is ranked in the lower half of the country. As reported by the MHA 2016 survey, roughly 16% of people in Illinois are affected by mental health issues—the fourth-lowest percentage in the country. The state also finished in the top 10 for two other adult care measures; Illinois had the eighth-lowest percentage of adults dealing with drug or alcohol dependence, and the fourth-lowest percentage of adults with serious thoughts of suicide. According to the Substance Abuse and Mental Health Services Administration (SAMHSA), 8% of adolescents in Illinois used drugs in 2012-2013—a figure lower than the national percentage during the same time period. The number of individuals age 12 or older who were dependent on drugs in 2012-2013 was also less than the national average. The 2016 MHA survey gave Illinois a ranking of 4th for young people with drug or alcohol dependence. 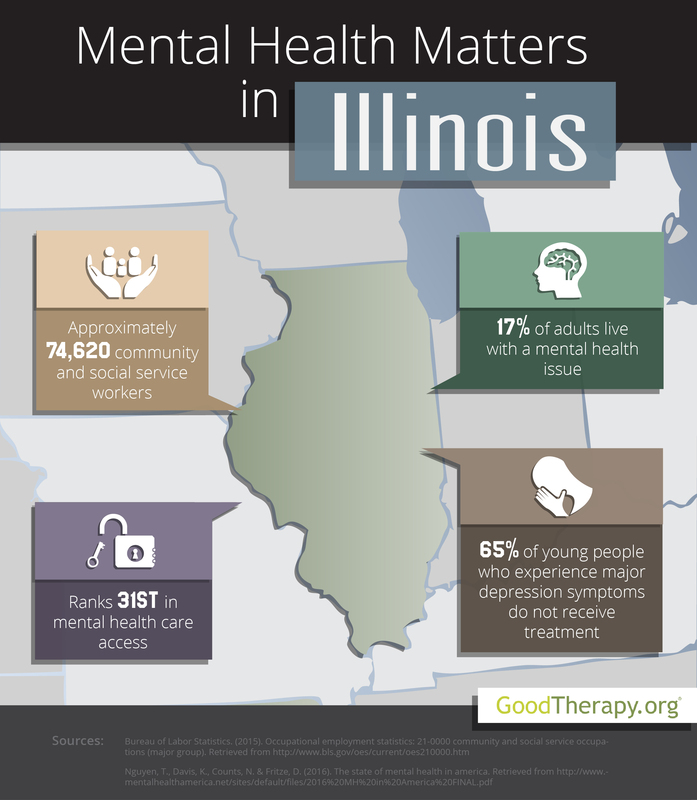 Despite these statistics, therapists in Illinois do have some concerns about the availability and accessibility of local mental health services. Data from the 2016 MHA survey indicates that among the population of adult residents with mental health issues, more than 56% did not receive any treatment, 22% reported unmet need, and 18% were uninsured. Among young people with symptoms of major depression, more than 64% did not receive professional care, while only 18% of young people with serious symptoms of depression received consistent treatment. Roughly 9% of children in the state have private insurance that does not provide coverage for mental or emotional issues.